In the world of full-size luxury SUVs there is big and then there is the gigantic Infiniti QX80 family hauler. There are others in this segment just as big but you won’t find another any more comfortable. This week, we have been test-driving the 2018 Infiniti QX80 AWD in the high altitude of Colorado. What we really wanted to see was if this big SUV would fit active family lifestyles, not only here in Denver but in other areas of the country. The 2018 QX80 gets some exterior improvements with new LED headlights, taillights, and fog lights, redesigned front and rear bumpers, restyled wheels and a rear tailgate. Underneath, it rides on a retuned suspension intended to improve ride comfort. Interior updated include a new center console featuring a cellphone storage pocket, and there's an optional smart rearview mirror that can switch to become a rearview camera screen, and additional insulation was added in the cargo area to reduce road noise. The 2018 Infiniti QX80 AWD ($67,850) comes loaded with standard features like heated leather-upholstered seats, hard drive voice-command navigation, lane guidance, weather, traffic, and restaurant guide; 13-speaker Bose audio system with SiriusXM satellite radio, Bluetooth streaming audio and iPod compatibility. Also standard are 10-way driver and 8-way passenger power seats, tri-zone automatic climate control, a multi-function steering wheel and four 12-volt outlets. The standard seating configuration is two front bucket seats, two second-row captain’s chairs with a center console and a three-place folding rear seat. This tester came with the optional second-row split/folding bench seat ($250). This QX80 tester also came with the optional Driver’s Assistance Package ($2,900) that includes Blind Spot Warning, Backup Collision Intervention, Intelligent Brake Assist with Forward Emergency Braking and Predictive Forward Collision Warning. The Theater Package was also included ($2,450) and features dual 8-inch monitors, heated second-row seats, and remote tip-up second-row seats. The Deluxe Technology Package ($5,700) included Adaptive Front-lighting System, semi-aniline seating, Hydraulic Body Motion Control system, Advanced Climate Control System, and Blind Spot Intervention. The Tire & Wheel Package ($2,800) includes 22-inch, 14-spoke aluminum alloy wheels with all-season tires and illuminated kick plates for an additional $465. Total MSRP including destination: $84,910. Inside, the QX80 is big, roomy and as comfortable as your living room with the leather, heated front seats. This big family hauler seats seven and came with second-row captain’s chairs. A three-seat bench in the second row is available for up to eight if you need more passenger hauling capability. Up front, we were greeted with leather galore! A heated wood/leather steering wheel and a driver’s seat with 10-way power adjustment and an 8-way passenger seat welcomed us. In the back, the captain’s chairs let the kids kick back and relax with plenty of room to spread out – so there’s no fighting. Between the seats there’s a gigantic console with two storage bins and two cup holders, making it ideal for long trips. The third row offers passengers good headroom and relatively good legroom, with the seats reclining 20 degrees. This tester came with the optional Theater Package with dual 7-inch screens for viewing DVDs. Mom can just put in the movie and the kids will be entertained for hours. For families needing to carry lots of cargo, QX80 offers 16.6 cubic feet of cargo space with the third row up – good for a small grocery trip. With the third-row seat folded, close to 50 cubic feet, growing to a whopping 95.1 cubic feet with both rows down. The power liftgate worked well as we loaded boxes and the button to close it is conveniently located on the inside of the hatch. It’s easy to fold the 60/40 third-row seat flat, with a pair of power buttons, located in the cargo space. Our QX80 came with the all-wheel drive and all models use a powerful 5.6-liter V8 engine with direct fuel injection, making 400 horsepower and a hefty 413 pound-feet of torque. The 7-speed double-overdrive transmission sends power to all four corners. The AWD system features a five-mode dial on the center console with automatic, four-wheel-drive high, four-wheel-drive low, low lock, tow mode and snow mode for all-weather capability for those interested in seeing the great outdoors. Fuel economy ratings for the 2018 QX80 are an EPA-estimated 13/19 mpg city/highway, or 15 mpg combined. Premium gasoline is required. For such a large vehicle, we found the V8 very responsive in all situations and the 7-speed automatic buttery smooth. This big SUV needs the V8 powerplant to get all that mass moving and it does a good job, even at the high altitude here in Colorado. There’s strong torque for quick acceleration when merging onto a busy highway and the QX80 floats down the road, absorbing the bumps. The big vehicle handles surprising quick for a giant SUV in the mountain corners. The trade-off is a bit of a firm ride, but it’s not overly stiff. We didn’t, however, get efficient fuel mileage this week as we pushed the monster SUV hard up I-70 into the mountains. Another downside to a vehicle this big is in the area of maneuverability in the city and it’s not easy to find a parking spot in those new shopping centers designed for smaller vehicles. It also takes a football field to turn the QX80 around. We had to be very careful to stay in our lane this week heading into Denver, in a construction area where the lanes narrow considerably. The Lane Departure Warning worked as advertised although it did get a bit annoying. 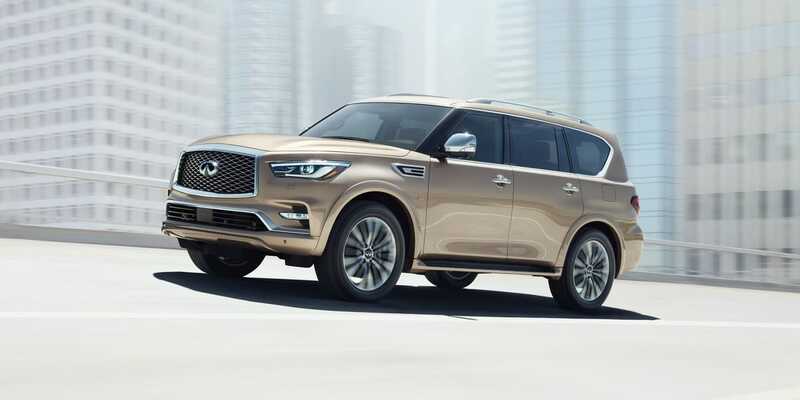 The 2018 Infiniti QX80 AWD has plenty of strengths and growing families will appreciate the powerful V8 engine, all the cargo space and passenger carrying ability this giant SUV offers. There’s plenty of optional packages that families will find helpful but they do drive the price up quickly. The downside to a vehicle like the QX80 is its tight-space maneuverability but if you can get past that, the view from the driver’s seat is pretty commanding.